A grant from the U.S. Department of Labor will cover the tuition for an entry-level welding certificate program offered May through July at the Milwaukee Area Technical College campus in Mequon, the school said Wednesday. The free tuition will be available as part of a $14.9 million grant to the Wisconsin Technical College System, part of the Labor Department’s Making the Future project to train more workers for careers in manufacturing. The supply of welders, machinists and fabricators is expected to fall short of the demand, as baby boomer workers leave their jobs and fewer young people pursue careers in manufacturing. The lack of skilled workers will slow business expansion and growth of the state economy, according to business officials. “Our biggest problem is bodies, the right workers skilled and motivated,” said Kurt Bauer, president and CEO of Wisconsin Manufacturers & Commerce. 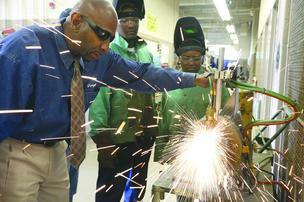 The free training provided by MATC is one part of the answer to the growing problem. Classes are scheduled to start May 26 and continue through July 24, with sections available during the day, late afternoon and early evening. Five classes will provide training in basic welding, blueprint reading, math and safety. Some of the courses can be applied to a welding technical diploma program. For more information email Christine Woda.